The coffee giant reduced its long-term guidance for comp sales and EPS growth, but Starbucks stock still offers an attractive risk-reward trade-off for investors. Shares of Starbucks (NASDAQ:SBUX) surged last month after the company posted blowout sales and earnings results for the fourth quarter of fiscal 2018. Comp sales growth rebounded to 3%, up from 1% a quarter earlier, driven by sequential improvement in Starbucks' two most important markets: the U.S. and China. Adjusted earnings per share jumped 13%, reaching $0.62. However, Starbucks stock has started to retreat over the past few days, after management cut its guidance for long-term EPS and comp sales growth at the company's 2018 investor day. Yet this may not be as significant a change as investors seem to believe. Starbucks stock performance. Data by YCharts. Last month, Starbucks released its guidance for fiscal 2019, which calls for adjusted EPS to reach a range of $2.61 to $2.66. That would represent 8% to 10% growth compared to its fiscal 2018 adjusted EPS of $2.42. Starbucks projected that comp sales growth would likely be "near the lower end of our current 3% to 5% range" in fiscal 2019. This guidance implied that comp sales growth would be below the midpoint of Starbucks' long-term guidance for the second year in a row -- global comp sales rose 2% last year -- and adjusted EPS would miss the company's target of at least 12% annual growth. That left many investors wondering whether Starbucks would reduce its long-term targets. Sure enough, at the investor day, Starbucks lowered its aim. It is now targeting 3% to 4% annual comp sales growth and annual adjusted EPS growth of at least 10% in the long term. Revenue and operating income are expected to grow 7%-9% and 8%-10% per year, respectively. This news touched off the recent pullback in Starbucks stock. But there are some important caveats that investors should be aware of. At the investor day conference, Starbucks reaffirmed its fiscal 2019 guidance, which calls for EPS growth to be below the company's long-term target. However, for fiscal 2020 and fiscal 2021, Starbucks expects annual EPS growth of at least 13%: well ahead of its new long-term guidance. The discrepancy is due to elevated share buybacks (as part of Starbucks' three-year, $25 billion capital return program) and savings from its ongoing cost-cutting activity. Thus, the "long-term" slowdown in Starbucks' EPS growth is not expected to happen until three years from now. A lot can happen in three years. New Starbucks CFO Patrick Grismer may not have been comfortable committing to 12%-plus EPS growth three years from now in light of the company's choppy results recently -- but that doesn't mean the old target is out of reach. Starbucks may be taking a particularly conservative approach in forecasting its future growth in China. The company has said that the vast majority of its sales growth in China will be driven by new store openings, rather than comp sales increases. Indeed, Starbucks' long-term forecast calls for 1% to 3% annual comp sales growth in China. That's even less than the 3% to 4% annual growth it expects in the U.S. and far below the 7% comp sales growth Starbucks achieved in China in fiscal 2017. To be fair, Starbucks faces growing competition in China. However, its recent rollout of delivery service as part of a broader partnership with Alibaba -- delivery is now available from 2,000 cafes in 30 cities across China, up from zero at the beginning of September -- has unlocked huge growth opportunities that weren't available to Starbucks just a few months ago. Furthermore, the coffee market is just starting to take off in China. There is phenomenal room for the market to expand. Thus, Starbucks and its Chinese rivals aren't faced with a zero-sum game -- there will be many winners as coffee gains popularity in China. 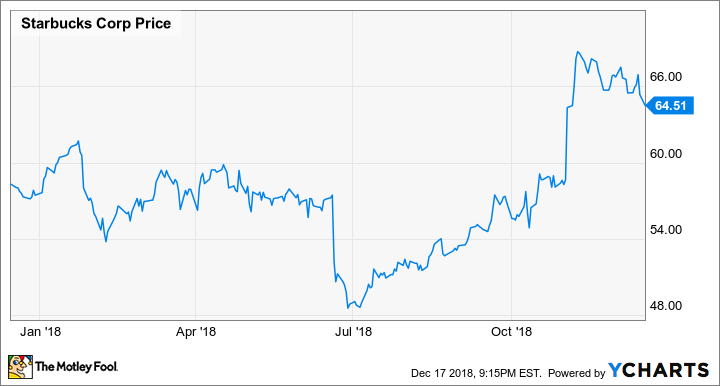 Based on its near-term guidance, Starbucks expects to earn at least $3.33 per share by fiscal 2021 -- and that number could potentially be quite a bit higher. Meanwhile, after its recent pullback, Starbucks stock trades for less than 20 times that base-case estimate for its fiscal 2021 earnings. Even if Starbucks' new 10% long-term EPS growth forecast turns out to be accurate, that's not too shabby, particularly for a company that pays a meaningful dividend. Starbucks stock may be a good deal more expensive than it was over the summer, but it still has plenty of upside for long-term investors.